Winners of the Mining, Energy and Related Services category! 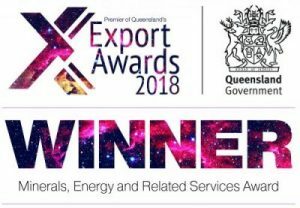 Core Resources is pleased to announce their latest award win at The Premier of Queensland’s Export Awards 2018 in the Mining, Energy and Related Services category. This award recognises Core’s extraordinary export growth through innovation and providing technologies and services that are superior to our global competitors. Core’s export sales grew 80% in 2017-18, servicing projects in 15 countries globally. CEO Rob Coleman acknowledged this fantastic achievement and attributed the award to the hard work and dedication of Core’s staff over the last year. As an award winner, Core has automatically progressed as a national finalists to the Australian Export Awards. The Australian Export Awards is a national program where industry winners from all states and territories progress as finalists to compete for an Australian industry award, including the coveted Australian Exporter of the Year… watch this space!